The SWAT-Tourniquet™ is a unique, multipurpose dressing. Its name provides a description for usage; Stretch, Wrap, and Tuck, but also the communities for whom it was developed - military and civilian Special Weapons and Tactics teams. These teams operate in an environment that has a high incidence of penetrating trauma. Most preventable deaths in the operational environment are from extremity bleeding. Use the SWAT-T as a tourniquet when bleeding is severe. Use in conjunction with appropriate gauze or standard dressings as a pressure dressing when bleeding is controlled or moderate. Even use the SWAT-T as an elastic bandage to support, stabilize, splint or immobilize a wound. The SWAT-Tourniquet™ allows a more rapid means to control extremity bleeding and allows application higher into the groin and axilla than other tourniquets. Its ease of application is one of its greatest benefits; individuals can effectively apply it in seconds with little to no prior training. The SWAT-T is almost a third of the cost and weight of other combat usage tourniquets. A 2013 study at Drake University identified several advantages of the SWAT-T over other combat tourniquets. The study suggested that that " ...the SWAT-T offers some significant advantages over the windlass design C-A-T and should be among the tourniquets considered for field or tactical use." 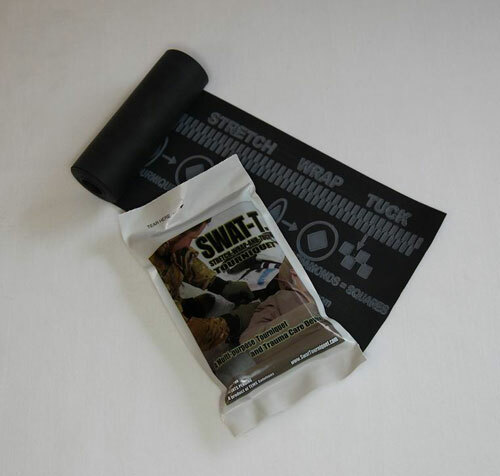 LATEX FREE and reusable unless soiled or damaged, the SWAT-T is now available in 2 colour options to suit your environment. Tactical Black or NEW Rescue Orange.